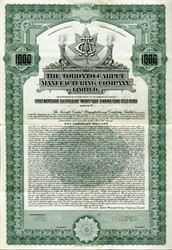 Beautifully engraved specimen $1000 gold bond certificate from the Toronto Carpet Manufacturing Company, Limited dated 1924. This historic document was printed by the British American Banknote Company and has an ornate border around it with a vignette of the company's logo. 40 coupons attached on right side. Liberty Village is a neighbourhood in Toronto, Ontario. It is bounded to the north by King Street West, to the west by Dufferin Street, to the south by the Gardiner Expressway, to the east by Strachan Avenue, and to the northeast by the CP railway tracks. Liberty Village is located on one of Toronto's oldest settlements. Fort York, on the south edge of community, was established by the British military in 1793. In the 1850s, both the Toronto, Grey and Bruce Railway and the Great Western Railway laid tracks across the community, cutting it off from rest of the city and altering plans to develop the area for residential purposes. Instead, Liberty Village became home to several institutions, including the Toronto Central Prison, opened in 1873, and the Andrew Mercer Reformatory for Women (on the site of today�s Lamport Stadium), opened in 1878 for women convicted of "vagrancy", "incorrigibility", or "sexual precociousness." Provincial Secretary William John Hanna forced the closure of Central Prison in 1915, and all its buildings were demolished except for the paint shop and chapel. "Liberty Street", for which Liberty Village is named, was the first street both male and female convicts would walk once freed. Bombs stored on Liberty Street, looking east from Dufferin Street, 1915 The area's proximity to the railway tracks led to its growth as an industrial area. In 1884, John Inglis and Company opened a factory to manufacture heavy machinery, boilers, and later, electrical appliances. Inglis' success led to its expansion onto Central Prison lands. In 1891, Massey-Harris (later Massey Ferguson) built a factory to produce agricultural implements. Other companies which established in the late 19th century included Toronto Carpet Manufacturing , St. David�s Wine, and Ontario Wind Engine and Pump. Industry continued to flourish during the early 20th century due to the area's excellent railway access and many spur lines, as well as a plentiful labour supply from nearby Parkdale. New companies included Brunswick-Balke-Collender (manufacturer of billiard tables and bowling alleys), Irwin Toy, Canada Metal, Simmons Bedding, Hinde and Dauch Paper, and Sunbeam Incandescent Lamp (later Canadian General Electric). Many of the factories produced armaments, bombs, and weapons during both world wars, and much of the soil pollution in the area dates from those periods. During the late 1970s and early 1980s, manufacturing operations within Liberty Village began to decline due to a shift from rail to road shipping, the need for larger manufacturing facilities, and lower manufacturing costs in suburban or offshore locations. In 1990, the Toronto Carpet Manufacturing plant on Liberty Street shut down, and the Inglis plant (owned by Whirlpool since 1985) ceased operations in 1991. The Inglis factory and Massey-Harris factory (with the exception of 947 King St. West) were demolished.